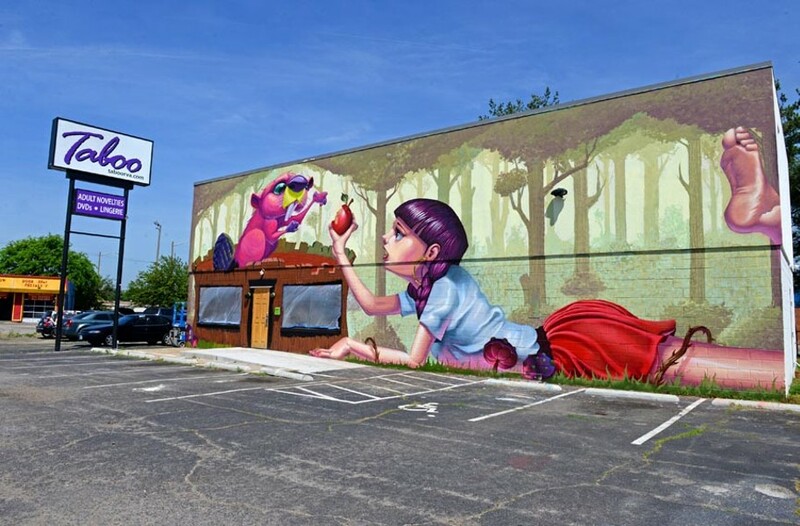 When local artist Jesse Smith asked my ideas for the mural he was preparing for Taboo’s shop on Midlothian Turnpike, my primary request was that it not be overtly sexual. I didn’t want to risk offending anyone, or to portray Taboo as a seedy adult bookstore, the likes of which it replaced when I purchased the building in 2013. The sketch he presented was bright, beautiful and fun. My only concern was the cheeky representation of a beaver. “If we have to, I can turn him into a squirrel,” Smith offered — and deal was sealed. As it turns out, no one really cares about the poor beaver. Instead, people are offended that the woman depicted appears underage, or will attract underage patrons, or both. A recent online poll by CBS-6 showed that 90 percent of viewers support the mural, but the drama has gone global, reaching news outlets as far away as England. It’s difficult to address such disjointed and absurd complaints, but here is my attempt: Taboo doesn’t allow entry to minors. The woman on the mural is meant to be an adult. And if I encounter a young child wandering unassisted down Midlothian Turnpike, I will place a call to Social Services instead of offering them an adult toy. I’m thrilled with the work of Smith and Miguel Del Cuadro, and I’m hoping they’ll fill the side of the building with a mural as well. My ideas include a depiction of their cartoon subject’s driver’s license or a terrifying child-eating monster to keep the kiddos away. — Alison Barber, owner of Taboo.